Last night I returned from Meribel after a two week visit in paradise. It was a change being there without wearing the Ski Instructor cap, and I have to say it was a real treat being back in the Alps after too long a break during the summers. I was there for two main reasons; firstly to photograph a wedding and secondly to have a summer holiday. The first morning I woke up like a very excited child. The mountains looked magnificent draped in their summer colours, the sun was out, I had a lift pass, selected lifts were open and my mountain bike was screaming at me "Get a move on and let's go". Some of you may know that I love my cycling, and recent footage on TV of the Tour de France in the high mountains fuelled my excitment even more. But you see, cycling in sleepy flat Leamington Spa is quite different to the steepness of the Alps. At the top of the Tougnete chairlift, I eased into my first descent. But up there, you can't ease into anything because it's rather steep for VTTs (as they are called in France). During that first morning I had an enormous amount of fun bouncing around here there and everywhere, skidding the back wheel like a five year old and generally not acting my age. However, I did scare myself a couple of times after coming close to hitting the deck and potentially damaging myself. And I couldn't afford to break any bones before shooting a wedding. So what was I to do? 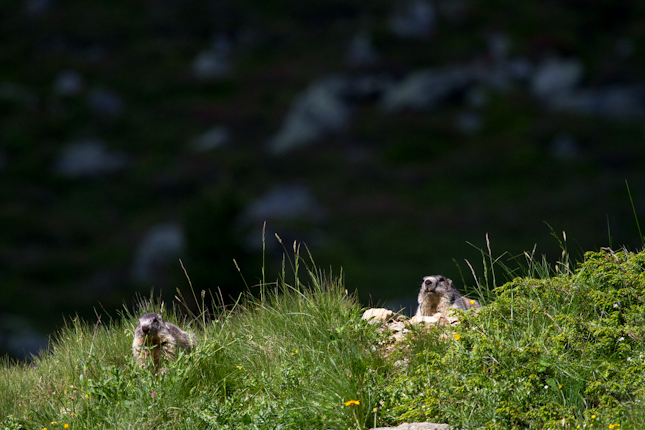 At the end of each ski season I often try and find some Marmottes and photograph them. 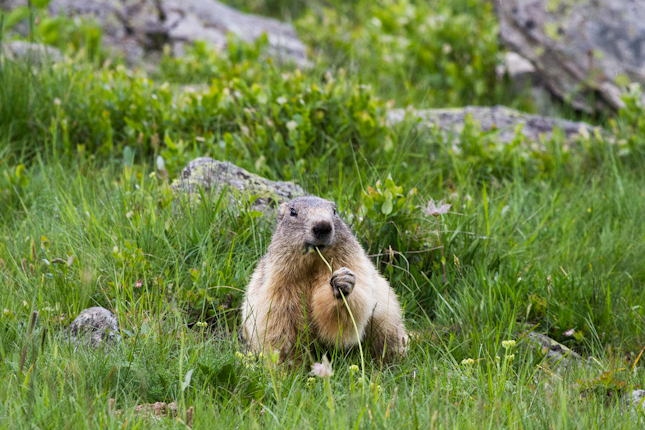 Because we had soo much snow last winter, sightings of Marmottes were very rare. So instead of whizzing around on my mountain bike, I decided to go in search of some furry animals that were difficult to find only a few months earlier. 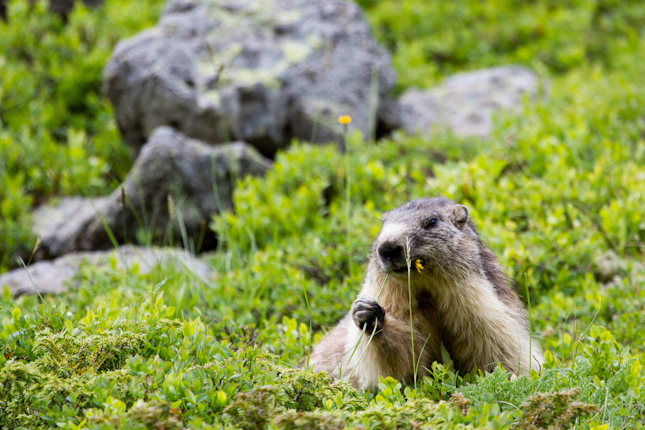 But what are Marmottes other than names of pistes, chairlifts and restaurants? 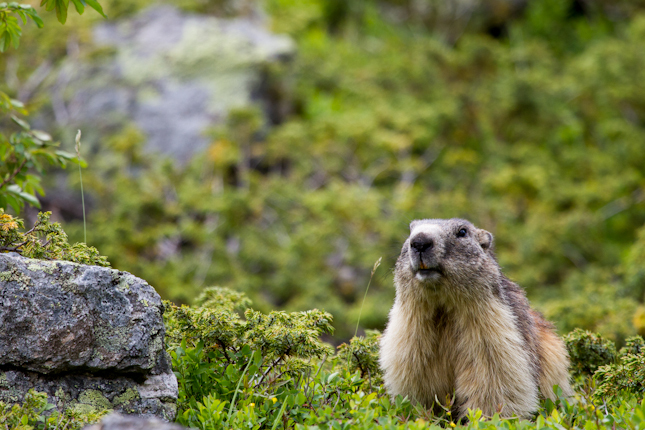 They are the European equivalent of North American Groundhogs. 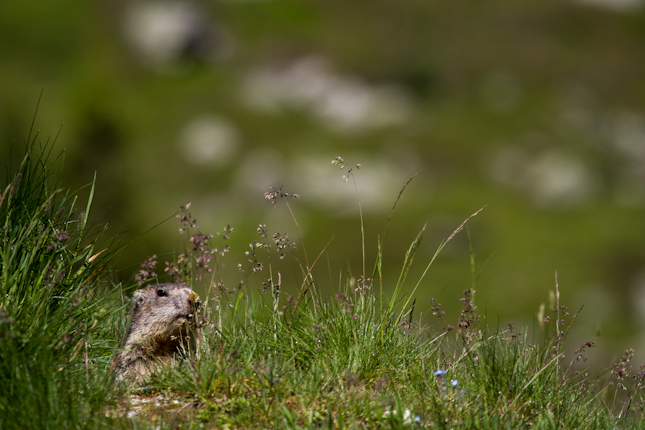 In winter these creatures hibernate down in their burrows under the deep snow above the altitude of around 1,800 metres. 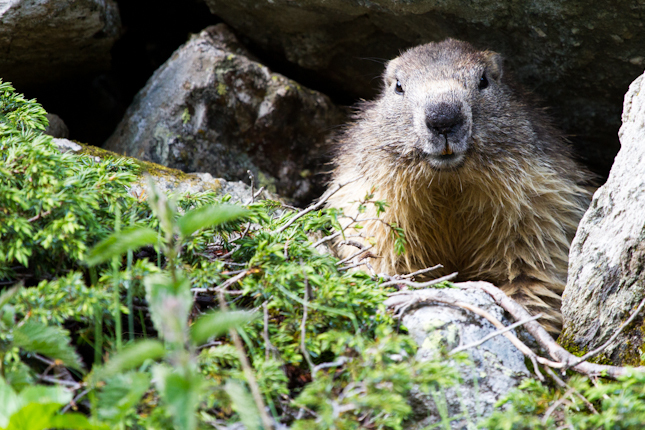 If you ski late in the Spring, you may well catch the first glimpses of them poking their heads out of the burrows, whilst you ride up on a sunny chairlift. 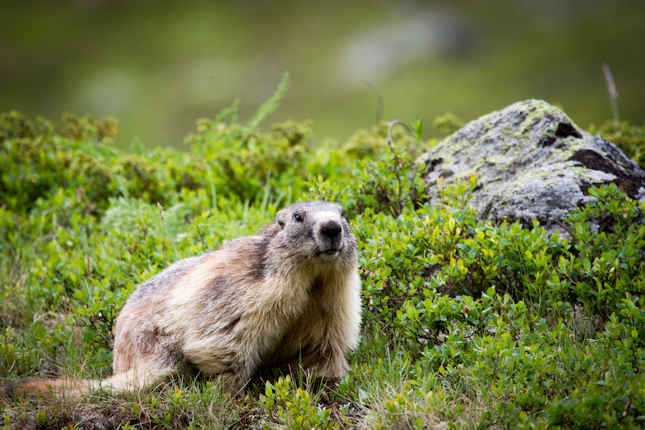 As the snow melts, they venture further afield from their burrows looking for food. 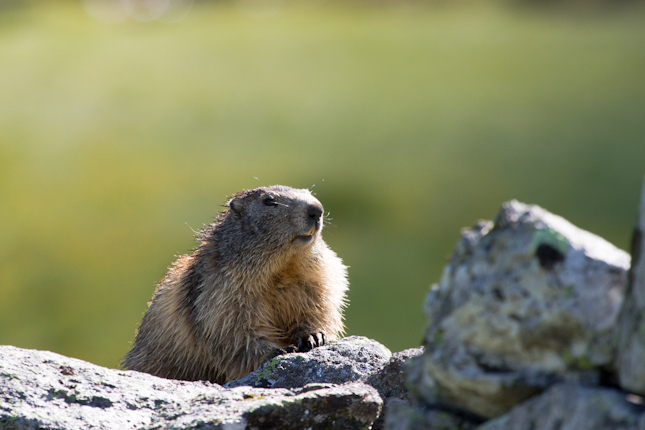 In the summer all they seem to do is munch on flowers, lie on top of rocks, look very cute, oh and do their best to avoid annoying wildlife photographers! Quite what other hikers thought of me commando crawling around holding onto huge heavy photography kit I do not know. But hey, we all have hobbies don't we? 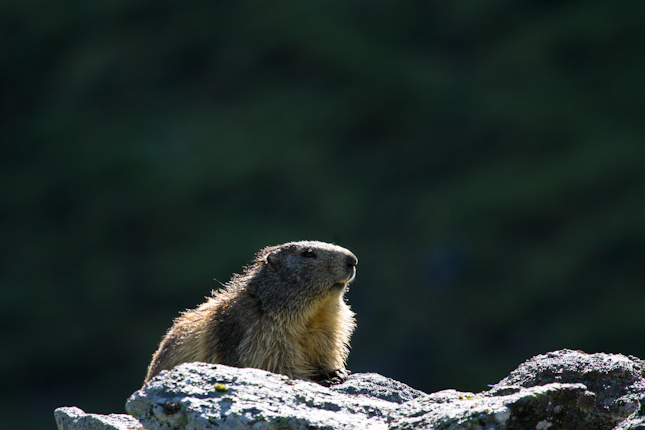 Here are a few images I took of our lovely alpine friends, you can click on the images to enlarge them.